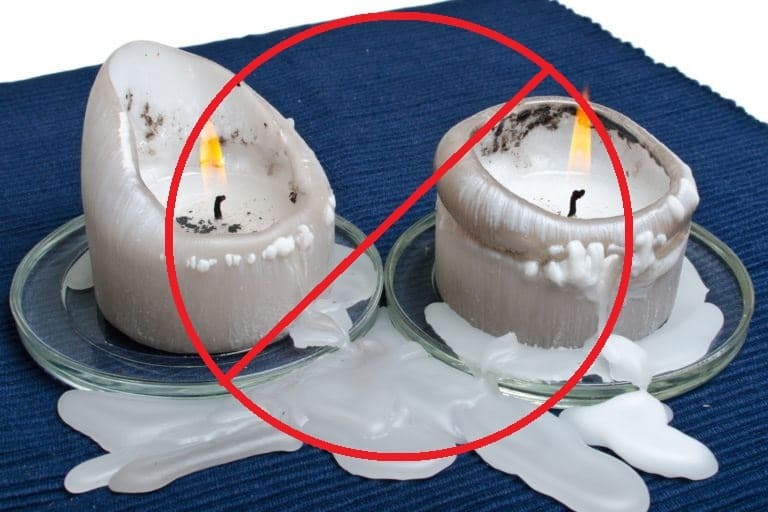 Real Candles: Yes, candles can create a beautiful ambience, but the mess afterwards is not worth it. Thankfully, faux candles have come a long way in the past few years. You can now get the look of real candles, including the flickering effect, without the wax or soot. Renting your linens or other décor items, such as vases or lanterns? Using real candles can leave marks on linens from the heat, even if used in a container. Melted wax can also be a huge pain to remove from linens, as it melts into the fabric, causing it to stick, and can be extremely difficult to clean. Keep in mind, that returning rented linens, or décor items, with stuck on wax can lead to paying extra cleaning fees that you may not have included in your budget. 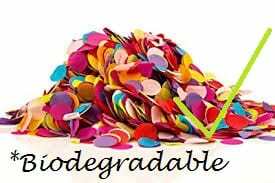 Even if you are purchasing your own linens or décor items, do you really want to destroy the items you just purchased? Using faux candles can alleviate any possibility of a mess, which is great for everyone! Are you super set on real candles, and really love the look of a real flame? 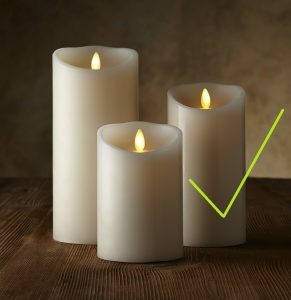 Consider mechanical candles as a close alternative. This style of candle melts internally, preventing spillage, while still giving you the real flame. 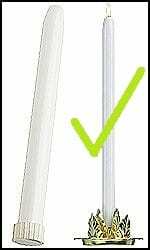 Mechanical candles are a great option if you are wanting taper candles, as they will give you the gorgeous look and romantic feel, without a waxy mess. Glitter and Confetti: Both of these decorations are a nightmare for venues and rental companies. The clean-up can be incredibly time consuming, and again, may leave you with extra cleaning fees. 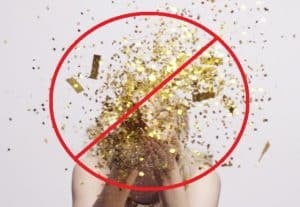 Some venues have completely banned glitter or confetti, so be sure to check with your venue before deciding on your décor. The other big issue for these types of decorations, is that they are not always bio-degradable. If you are considering throwing glitter or confetti as part of your send off, be sure to use bio-degradable products, as otherwise you could potentially be poisoning birds, squirrels, and other critters or environments. If you are dead set on having your guests throw confetti as you make your grand exit, consider extra-large sized confetti. This will not only allow for easier clean up, as the confetti bits will be easier to find as a larger size, and they will show up better in pictures! 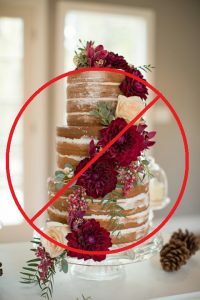 Naked Cakes and Food Walls: Although these items seem like polar opposites, simple cake versus a big, fun display, both options are out for similar reasons. They both can look pretty neat, but after sitting for a bit, these desserts will leave you dry as the desert. If you really love the look of a naked cake, consider trying a similar option of a translucent cake. This newer trend of cake gives you less frosting than a traditional wedding cake, which can be great for couples who are not huge fans of sweets, but will also prevent your cake from drying out. 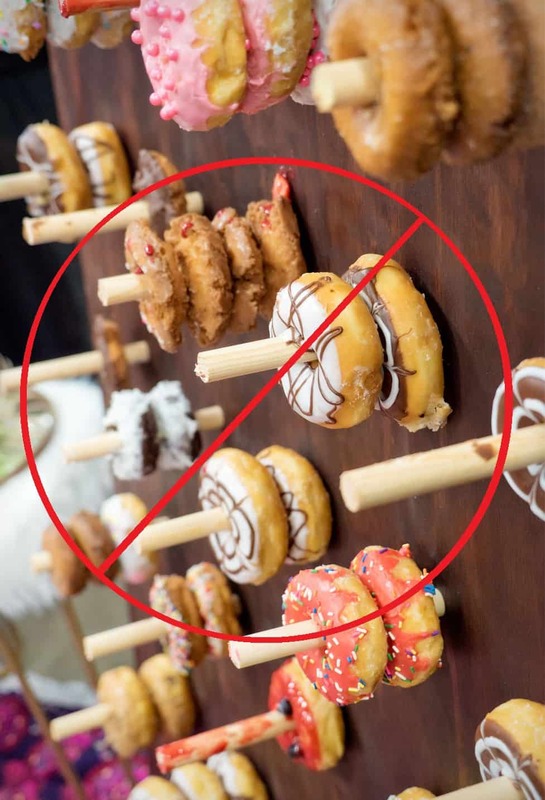 Food walls, or interactive food displays, such as donut walls, can look great and be a stunning way to display dessert. However, not only will your dessert options dry out, but sitting in the open allows for guests to touch before deciding. This means, unwanted and potentially unwashed fingers touching all of your pretty donuts. Also, depending on the season, you may need to worry about bugs! The last thing you want is to have ants crawling all over your dessert display. Large Floral Center Pieces: While giant floral displays can look gorgeous by the seating chart, or photo booth, you may want to reconsider using them on guest tables. Your guests, even if a bit shy, will hopefully be participating in conversations with fellow guests at their table. Having a giant center piece that blocks the other side of the table, can be a conversation stopper. No one wants to have to crane their necks around just to talk to the person sitting across from them. Instead of giant floral displays on your guest seating tables, consider having smaller center pieces. Keep the larger decorative accents for tables that are against a wall, or in locations that will not end up blocking anyone’s view. 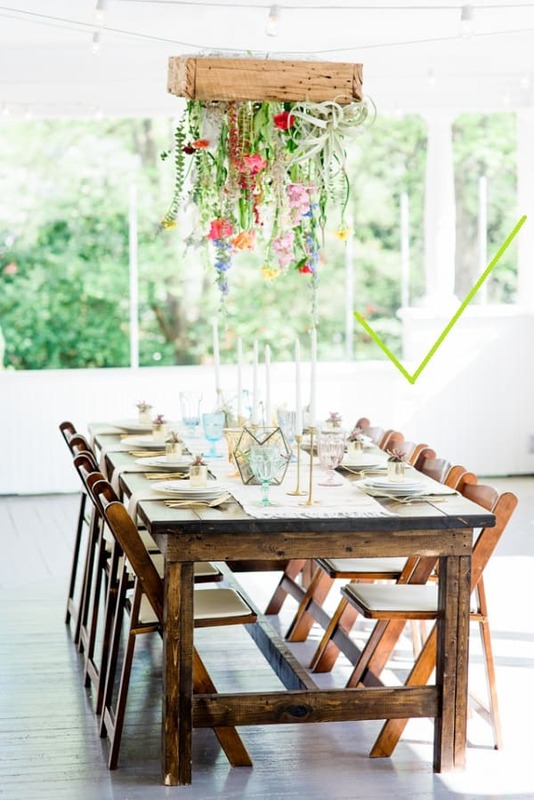 If you are in love with the idea of large floral displays at your guest seating tables, talk to your venue about hanging your décor above the guest tables. 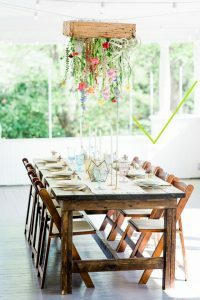 Hanging floral displays are very in for 2019, so venues may be able to work with you if you have hanging flowers or greenery as part of your decor. Baby’s Breath and Rustic Spaces: It’s time for something new. 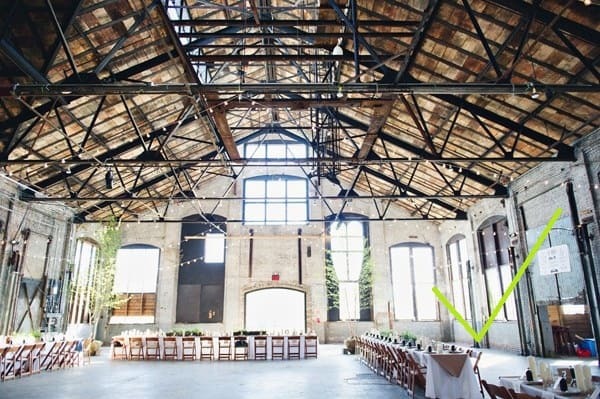 Brides in 2019 will be looking to more industrial spaces for their receptions. 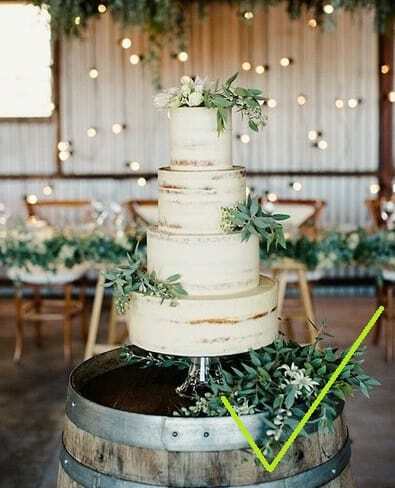 Of course the rustic style may still be incorporated, along with greenery, to give these open spaces a bit more warmth. 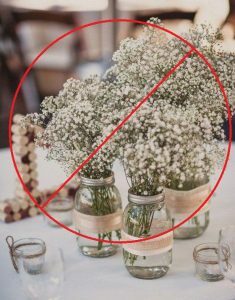 But when it comes to Baby’s Breath in mason jars, this décor option is becoming a thing of the past. 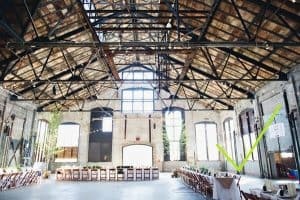 Couples wanting to bring in a bit of a rustic feel into their industrial venue, are looking for something more creative than the same old rustic décor. We may still see some Baby’s Breath used to bulk up bouquets, but no longer as large displays of only Baby’s Breath. 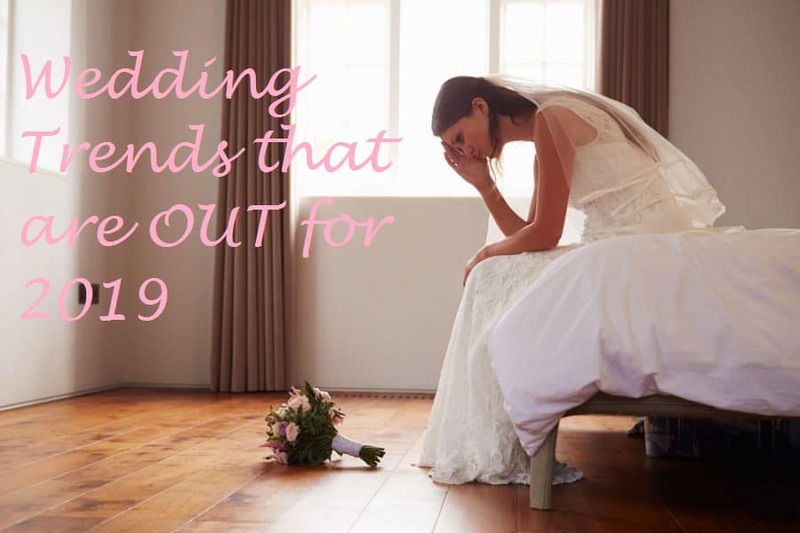 Not only are couples opting for a more interesting and colorful flower options, but word is getting out on the strength of the scent of Baby’s Breath. To put it nicely, if you use this as your aisle décor you better hope there is a nice breeze, or no one will want to sit in an aisle seat. Baby’s Breath being out for 2019, will hopefully be a nationwide trend. The use of industrial spaces, however, may be more likely to stick to the coasts, and to large cities, for now. Those of us living in ‘fly over county’ still love our barn and ranch wedding venues, and that trend is not likely to leave the middle of the country for quite some time.